With a voice not unlike that of Tom Waits, deep, dark, and throaty, marred by cigarettes and alcohol, the same things that give it its depth and flavor, comes Milwaukee, Wisconsin's The Gunshy. 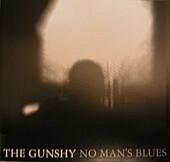 The Gunshy is the musical outfit for one Matt Arbogast, who, along with a cast of friends, has created a well-worn, bar-flavored indie-folk record that tells a story well, and conveys its principal point without beating around the bush. The songs are well written, the voice an acquired taste (but the thing that really takes the songs from mediocre to powerful), and the performances dark, just the way they need to be. Here is a record you can imagine playing late at night, as you try to sober up, or at a bar while you get loaded. It's got its time and place, but when the time and place are right, its moody, indie-cool branded folk-rock flavor hits the spot. I'll give it a B-.